Despite that, meat has never been a big part of our diet, and it’s not something we cook with at home very often. We made that choice very consciously when we were first married based on simple arithmetic: it takes more land, water and sunshine to make a pound of meat than a pound of vegetables — and there is only so much water, sunshine and land to go around. Given that, and the fact that there are people who go to bed hungry, a meat-rich diet always felt like taking more than our fair share. It always felt selfish and wasteful. Having been raised in traditional North American households, though, we both grew up with meat at the centre of our diets, and enjoy meat’s bite and texture, not to mention that burst of umami. 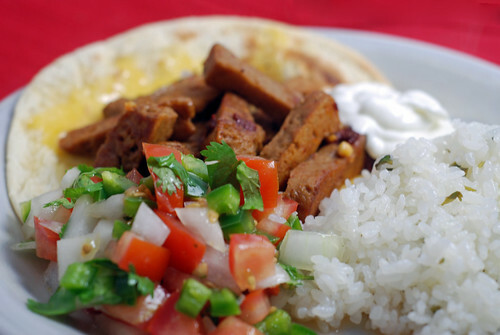 When a meal calls for that, we often use seitan. 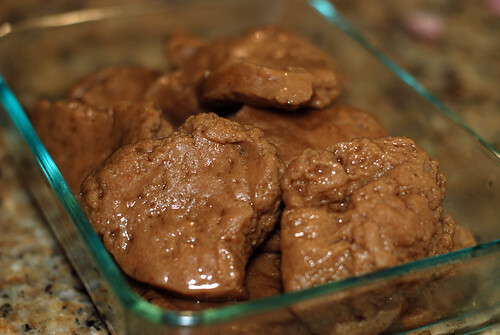 There are many varieties of commercial seitan, and most are very tasty, but if you’d rather opt out of the additives, packaging and transportation that come with processed food, you’ll be pleased to note that it’s easy to make at home. We made our fist batch this weekend, and it was better than any packaged seitan I’ve ever tried. It was flavourful on it’s own – even better after sitting in a chipotle marinade – and had a great mouthfeel. We used it to make tacos, which we served with a fresh homemade salsa and cilantro rice. I’m currently working on a vegetarian collection for the 222 million tons app, and this recipe definitely made the cut. Warm 4¾ cups of stone soup broth over medium heat. Remove ¾ cups of the broth to make the seitan. Add in the tamari, lemon juice and crushed garlic. Put the flour in a bowl, pour in the spiced broth, and mix. Take the elastic glob that forms out of the bowl, squeeze out any excess liquid, and knead it for 2 or 3 minutes until it gets tough. Shape it into a loaf, and let it rest for 15 minutes. While the seitan is resting, add the water, tamari sauce, ginger, onion and garlic to the remaining broth and bring to a low boil. Cut the seitan loaf into ¼ inch slices, then boil those in the broth for about an hour.